Anodized aluminum finish provides strength and beauty! 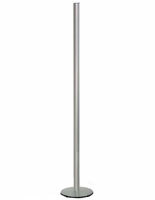 Grooved pole allows accessories to be affixed at any height! 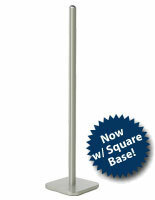 Large, heavy base prevents wobbling or tipping! 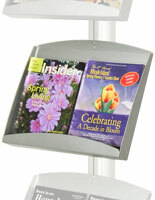 This banner stand is the base unit to almost any display stand you can imagine! Part of our popular FORTE series, it is designed with two grooves running down either side to connect various accessories, including snap frames, literature holders, and display shelves. The grooves, one of the key benefits of the banner stand, allow a user to completely adjust the vertical placement of accessories. 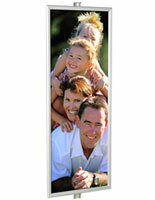 This banner pole, banner stand is sold in many different accessory configurations. However, it is sold alone here to allow complete customization. 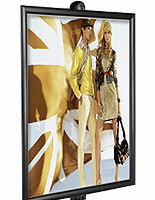 The banner stand provides endless uses for a retailer, restaurateur, or any business. 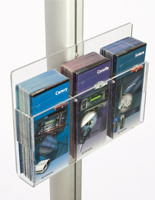 Retailers can simply place snap frames on the stand to advertise products. 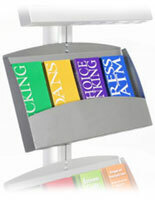 Paired with snap frames and metal trays, it is perfect for displaying a restaurant menu, with "TO-GO" menus below. 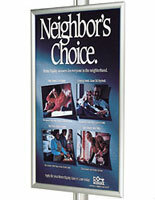 The banner display is an ideal banner stand for use in business lobbies, universities, or other community locations, as well. The possibilities are endless! 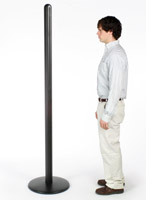 And, standing eight feet tall, the banner stand will get noticed anywhere it is placed. 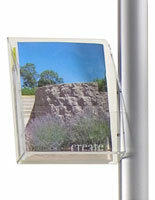 The banner stand, also known as a banner pole, is finished with silver, anodized aluminum. This finish provides both strength and, because of the soft, neutral color, versatility in placement.